Having a little fun with a family. I shoot this family every year, and we try something a little different every session. Always fun and always good to see them. Ocean Isle Beach, NC. I love photographing family beach portraits. I do this all summer long. I charge a flat $250.00 for the session, no limits on group sizes. I prefer to shoot about 45 minutes before sunset to take advantage of the best lighting of the day. When you schedule we'll put two days aside for inclement weather, just in case we get a late day storm. After our time together, I go back to my office/studio and edit the photos for clarity, color balance and exposure. I then put them on an online private gallery so that you can download all the original images directly to your phone, tablet or computer. A release letter is included so that you can have prints made at the processor of your choice, or you can take advantage of my online wholesale pricing. I make this as easy as possible for everyone. What to wear. Khaki and white, jeans and white, black different color T shirts for different family groupings, almost anything. What you want to avoid is loud Hawaiian type shirts unless everyone is wearing them. We want you to stand out in the photo, not your shirt. How it works: Generally I do multi families. 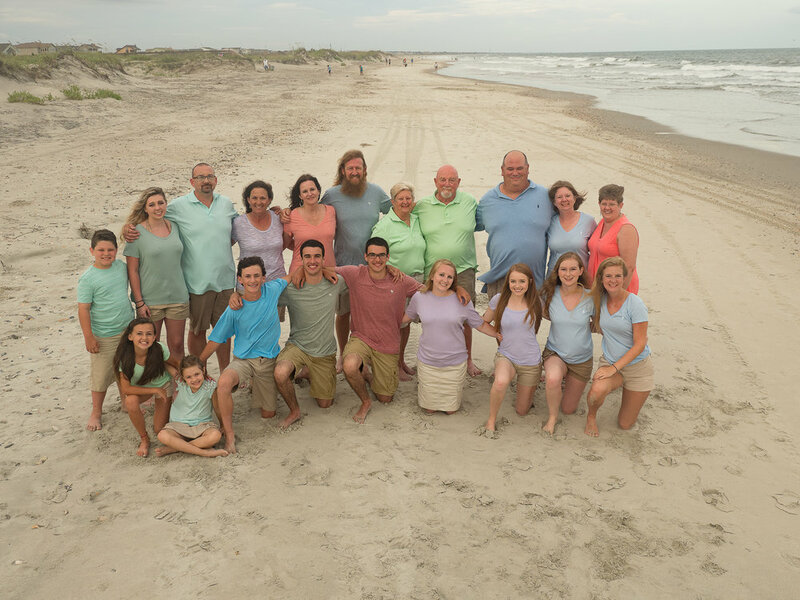 Families come to the beach for some vacation time and they decide it's a good time for a family photo. I prefer to shoot about 45 minutes before sunset as the beach clears off a little and the light is fantastic. I'll start with a large group shot of the family and then break it down into smaller units. I'll end up with candid photos of the kids playing and right at sunset do another large group shot. If there are kids who just aren't good at that time of day, we can schedule a little earlier. Not optimal but somehow we make it work. Sunrise is also an option. Sunrise is great as the beach is pretty empty and the kids enjoy being out early. Other considerations. The beach almost always has a breeze going, sometimes it's downright windy. If you have long hair, please have a way to tie it back. We want dunes and ocean in the background, not houses and porta johns. We don't want to be at the mercy of the wind. Ok, this sounds great, how do we get on the calendar? Please fill out the booking from and I’ll be in touch shortly to discuss date/time. Grand kids doing piggybacks. Ocean Isle Beach, NC. Love the jump shot. Makes the session fun. Ocean Isle Beach, NC. Love the different color shirts and the sweep of beach in the background. This is why I bring a ladder. Holden Beach, NC. I love this kid. What a great face! Carolina Beach, NC. Big jump shot. Did this in two takes. Lot's of fun! Holden Beach, NC. This is why I love big groups. Get to have some fun! Holden Beach, NC. Family holding hands looking at the ocean. Beach in foreground. North Topsail Beach, NC. Couple session at Sunset Beach. Three brothers dipping their wives at Topsail Beach, NC. 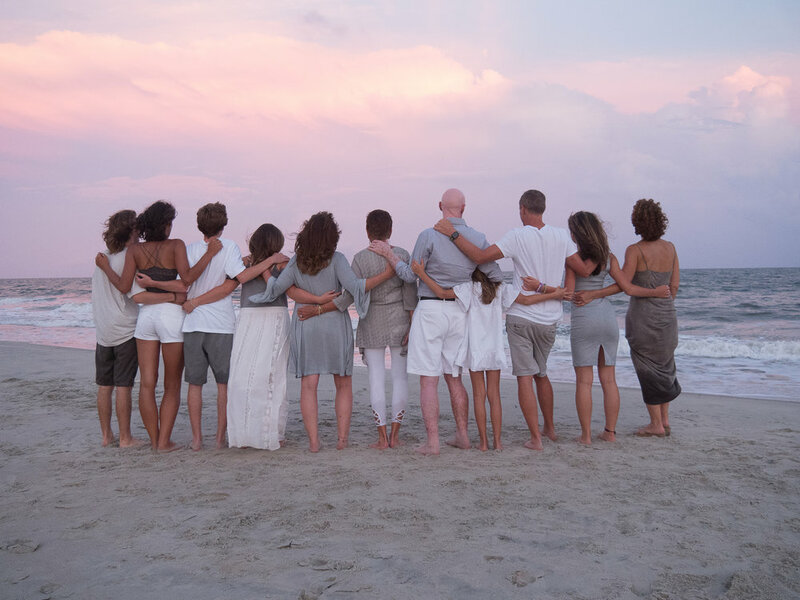 Family grouping on North Topsail Beach, NC. Sometimes a small group is fun. We had lot's of time to play. Sunset Beach, NC. Little beach fun with a couple and their daughter. Sunset Beach, NC. Couple shot with rainbow at Topsail Beach, NC. Kids walking on beach. Topsail Beach, NC. Sometimes simple is best. Brother and sister holding hands on the beach. Topsail Island, NC. Brother and sister sitting on beach looking at each other with ocean in the background. North Topsail Beach, NC. Love this shot. All the married couples kissing on the beach with the ocean in the background. North Topsail Beach, NC. Mother and daughters, Ocean Isle Beach, NC. Cousins at the beach with ocean in background. Ocean Isle Beach, NC. Family with arms wrapped around each other looking out at the ocean at nautical twilight. Ocean Isle Beach, NC.